CELL PHONE COVERAGE is spotty at best and non-existent in most areas of the park and surrounding state forest. Please plan accordingly and do not rely on cell phone usage. The park is surrounded by Michaux State Forest, which provides opportunities for exploring extensive public lands around South Mountain. The park office is open specific hours. Beaches, overnight areas, and other areas are open specific seasons and hours. Contact the park office for facility seasons and hours. The park is easily reached from I-81. Visitors should take Exit 37 to PA 233 south then travel for eight miles. Double the fun! Swim in two lakes, build sand castles at two beaches, and picnic in two different picnic areas (lunch and dinner?) -- all separated by a short bike ride. Set foot on the famous Appalachian Trail. The park is the halfway point for this 2,186-mile National Scenic Trail. Walk back in time on the Historical Walking Tour of historic buildings. Explore an iron furnace from one of the most productive iron communities of the 19th Century. Relax in the modern campground with upgraded facilities. See hundreds of jack-o-lanterns float on Fuller Lake during the Fall Furnace Festival. Visit the first hiking museum in the U.S., the Appalachian Trail Museum. See the park from above! Hike up to Pole Steeple Vista and view the eastern part of the park and surrounding Michaux State Forest from the overlook. Tour of the Ironmaster’s Mansion. Once the home of the iron operations ironmaster, some famous Americans slept here too! Enjoy year-round trout fishing in the stocked Mountain Creek and Laurel Lake. Just south of the park in Michaux State Forest is a trailhead that provides parking for vehicles and trailers, and access to many miles of trails on state forest lands. Maps of the trails are available at the park office. This weekend-long event is held during October. Historical demonstrations, park programming, entertainment, hayrides, and food and craft vendors provide a great family-oriented event. The highlight of the weekend is the telling of the, “Legend of the Hairy Hand,” which includes a float of hundreds of lit jack-o-lanterns on Fuller Lake. Held every June, this weekend-long event features a banquet, hikes, guest speakers, music, and children’s programs. 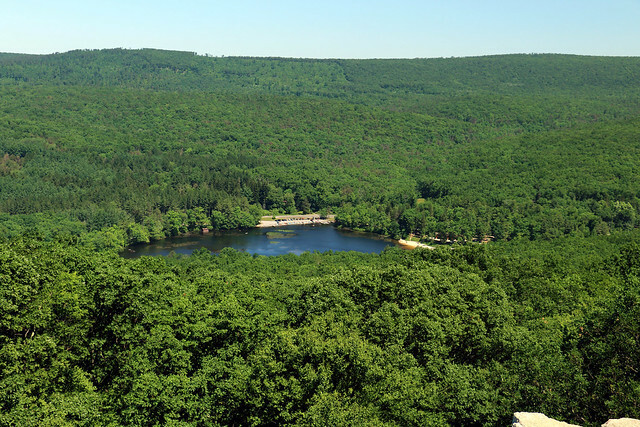 Spring through fall, Pine Grove Furnace State Park offers a wide variety of environmental education, recreational, and interpretive programs. Through hands-on activities, guided walks, and programs, participants gain appreciation, understanding, and develop a sense of stewardship toward the natural and cultural resources. Curriculum-based environmental education programs are available to schools, youth organizations, and homeschool associations. Group programs must be scheduled in advance by calling the park office. This activity or structure is ADA accessible. The ADA accessible park visitor center in the park office has exhibits on the historic charcoal iron furnace community, which flourished for more than 130 years. The park office and visitor center is open year round. April through October, the visitor center is open daily. The center is open Monday through Friday during the rest of the year. The museum welcomes newcomers to the AT, as well as veteran hikers, and frequently offers an opportunity to meet current thru-hikers. The Children’s Discovery Area provides fun, hands-on learning experiences. The museum is in the Old Mill Building at 1120 Pine Grove Road (along PA 233) between the Pine Grove Furnace State Park office and the Pine Grove General Store. The museum is open seasonally. Check the website for hours of operation. Admission is free of charge, although donations are welcomed. Parking for the museum is adjacent to the Furnace Stack Picnic Pavilion. Located at 1212 Pine Grove Road, (along PA 233), this renovated, historic, brick mansion is operated by the Central Pennsylvania Conservancy. In addition to serving as a hostel and providing dormitory-style lodging, the mansion is an educational facility with meeting rooms, and a venue for wedding receptions, family reunions, and special events. The mansion was built in 1829 by the ironmaster Peter Ege and has an impressive history of guests and owners, including senators, federal department leaders, a millionaire, and a university founder. The Ironmaster’s Mansion is open April to December. To book an overnight stay, wedding, meeting or special event, please contact the mansion at 717-486-4108.